How Safe Is Macy's and Its Dividend? If investors get a whiff of sustained growth, the stock has big upside. Macy's (NYSE:M) has bounced back after three consecutive years of weak traffic trends. The department store chain has reported improved traffic this year and investors are hopeful for a strong finish to 2018 in the all-important holiday quarter. The stock is up about 14% over the last year, outperforming the broader market, as the iconic retailer is on pace to report its first year of growth in comparable-store sales since fiscal 2014. However, Macy's isn't out of the woods yet. The shift to online shopping has hit other department stores hard. Macy's must continue to report positive earnings results to pay down its debt. Macy's flagship store at Herald Square in New York. Image source: Macy's. Macy's stock is very tempting at these levels, thanks to its cheap valuation -- the stock trades for just eight times analysts' 2019 earnings estimates -- and its above-average dividend yield of 5.3%. But is it a safe investment? It seems the only thing that would cause a hiccup in Macy's turnaround would be a recession -- but then again, that would hurt the whole industry. Over the last year, Macy's generated over $1 billion in free cash flow and paid out $462 million in dividends. The company has been able to pay down debt, reinvest in the business, and still pay dividends. This table shows how much free cash flow Macy's has generated, in addition to cash raised from asset sales. Both free cash flow and asset sales have financed the company's debt payments and dividend distributions. Data source: Macy's. TTM = trailing 12 months. Chart by author. The dividend appears safe. It's even safer given that Macy's owns more than 300 of its stores. Its real estate was estimated to be worth as much as $21 billion in 2015. Since then, Macy's has sold $1.4 billion worth of assets. The company has more than enough resources to handle its outstanding debt, so investors should feel comfortable owning Macy's stock for the dividend. Data source: Macy's and Y-Charts. TTM = trailing 12 months. Chart by author. Given the stock's low valuation, investors are not expecting Macy's to sustain its recent growth. If the company can continue to report positive comps, the stock offers tremendous upside from current levels. Through the first three quarters of the year, Macy's comparable sales growth was 2.7%. Also encouraging was its 67% growth on the bottom line. Analysts expect the company to report adjusted earnings of $4.23 per share for 2018. 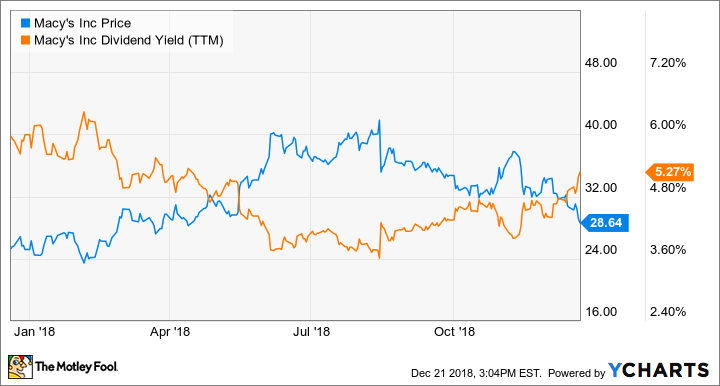 Macy's Dividend Yield (TTM), data by YCharts. Macy's sales of underperforming stores have helped comps improve. Management has invested the proceeds into developing what it calls its "Growth 50" stores. These are stores that have received improvements in lighting, merchandise assortment, staff, localized marketing, and an enhanced mobile shopping experience. Based on the positive results, management is planning to roll this strategy out to another 100 stores in 2019. During the third-quarter conference call, CEO Jeff Gennette made it clear that this is a turning point for the company. "This investment will help us continue the momentum of our stores business and drive the top line into the future," he said. Also, management has done an adequate job of implementing a digital shopping experience. Customers can buy eligible items online and pick them up in a nearby store just two hours later, as well as have orders shipped to a local store for pickup. These options have been popular with customers. The company's e-commerce strategy is working so well that Gennette referred to Macy's mobile app as a competitive advantage: "Macy's recipe for success is e-commerce, healthy stores, and a great mobile experience that ties it all together. It is our competitive moat." He went on to imply that there are still things in the works to make the mobile experience even better, stating, "Our e-commerce business just completed another consecutive quarter of double-digit growth, driven by continued improvement to our online offering and experience. We invested early in mobile, and our mobile app just keeps getting better." Gennette also explained that when Macy's closes a store, online sales in that market decrease. This implies that Macy's store footprint is serving as marketing for the brand. It also highlights how the company is using its stores as fulfillment centers, allowing efficient delivery of merchandise to customers. Plus, when customers choose to pick up an online order, there's always the chance that they will decide to buy something else at the store. This omnichannel strategy is helping the company stand out at a time when other department stores are performing poorly. Macy's is in a good position heading into the critical holiday quarter. Despite the upbeat forecasts from analysts for strong consumer spending, Macy's inventory at the end of the third quarter was only slightly higher than it was a year earlier. This should allow the company to sell through more merchandise at full price, keep margins firm, and deliver solid earnings. ... [C]onsumer confidence is very strong. The spending is strong. I think the predictions when you look at where consumer spending is going to be during the holiday season, it's a very good backdrop for us. Macy's has been a standout in the department store space lately, with Sears Holdings filing for bankruptcy and J.C. Penney posting negative comp sales. Macy's is not without risk in the long term, given that most of the company's merchandise is not exclusive. Customers can shop online and compare prices very easily with other stores. However, at a forward P/E of just 7.9, on top of the improvements discussed above, the potential rewards far outweigh the risks for this iconic department store.